The preoccupation of old people, assuming their memories are still keen and intact, is to look back at their prime. And it surely is a very interesting, at times melancholic, to recall days of fullness and want, more so, the struggles, the adventures, in defying and challenging death like immortals and succeeding in squeezing pleasure in the end. While others fell, while others got lost, while others simply disappeared, there are those like us who remained seemingly untouched by the rudeness and vulgarity of reality. We were there in rough times, we were there engaging odds, we were there at the mercy of the elements. Our common friends were also with us, some them however succumbed, some of them hemmed and hawed, some of them virtually got their just desserts, some of them faded and that probably included us in the batch. We faded in the background. But we simply blended with the environment, never losing our thoughts, never losing a bit in the fashion of the day. We are still active although not in the youthful sense of the word. We still longed to be in the limelight, well, no longer as protagonist but on cameo role only, just to show the world that we are still in the heat of things. Not that we can no longer act, but our days at the top has declined, our days at the top has rather been bleached, our days on our way down from the top has been numbered already. 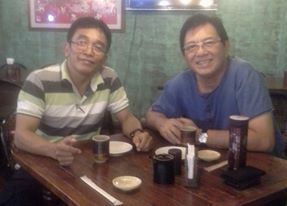 A friend of mine, Joel Villanueva, dropped by after a near death experience at the Heart Center. He was back in harness, a true survivor. And why not. We got to know each other in Palawan. I was then the prison superintendent of Iwahig Penal Colony, Joel was a daring do daredevil, an Evel Knievel motorbike race driver and also a resigned government functionary. That was 1995—20 years ago—and we are now in front of each other to size each other up and complement the day. Joel on his dirt bike can swiftly glide into any kind of rugged terrain in an outback of Palawan, a sight to behold, a stunt that could stun an observer. There was one incident where he stumbled almost fatally. He rose up, stretched himself and dusted off just like that. He was that great. That was before. I learned lately that he fell, toddler like, on his bicycle while negotiating in a wide road. All his bones were scanned and for almost a month, he was bedridden. We were then in our 40s, looking more like demigods and fearless, athletic and full of enthusiasm. Now, we are in our 60s and looking more like newly recruits in the geriatric ward! Before, our conversation was more on sexual escapades, more on virility, more on machismo. Now, it’s more on determining which medicine suits us best! Before, we were exchanging notes on how to charm. Now, we are sharing ideas on how to get a good night sleep! Before, we wanted to capture the world. Now, we are wondering in what part of the world we will be scattered. Before, we were excited on to find what the good life is all about. Now, we are contented just to live. We are thankful not because we made it in this life, but because we are still lucid despite the thrills and trauma of living. Posted on August 20, 2015, in Uncategorized. Bookmark the permalink. 1 Comment. Venancio sometimes I wish life was just like that…Just as I was almost giving to hope for assistance with Toast masters Speechcraft group inside Bilibid from outside, an email appears from the Philippine’s Area Governor for Toastmasters wanting to have a meeting at SM Aura to discuss assistance inside Biibid…So last Weds we had a very successful meeting and on the 26th September there will be a public meeting at Jeruel,, to give out Speech completion certificates and a public demonstration of a Toastmasters meeting. a.prayer well and truly answered..My comment is that even though I am 70+ this the peak of my association with Toastmasters which began in Shanghai in 2006…when I should be lying in my hammock watching the beautiful Philiippines sunset at the sunset of my existence on this planet..You have many years of existence left don’t waste them..you have many talents that bring happiness to others as well as yourself…This is my kindly advice,, to someone I respect and many past inmates respect..